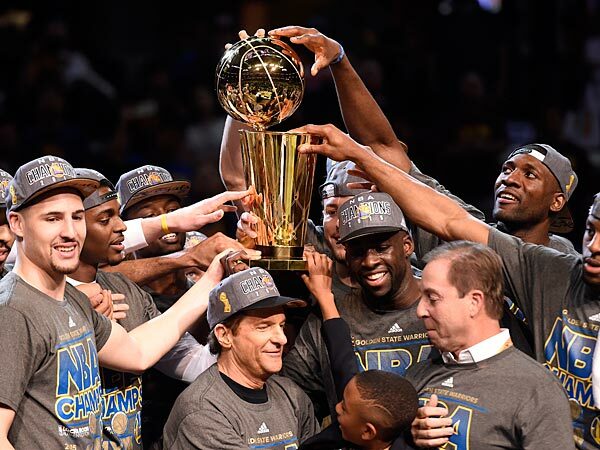 The current version of the Warriors, in my opinion, are likely the greatest team in NBA history with their perfect storm of stars with the right attitudes and skill sets to compliment one another and mesh perfectly for an offensive and defensive juggernaut. While the Warriors have already won more games than any team in NBA history over the past three seasons, including a 73 win season and two NBA titles, many around the league think that they are just getting started. Splash Brother and the most overlooked and underappreciated star of their fearsome foursome in my opinion, Klay Thompson, says that the Warriors are trying to keep their eyes on the prize and have the sort of success the Bulls dynasty did with Michael Jordan in the 1990s. “What’s that, six championships in eight years?” Thompson said Saturday, when asked whether the Warriors were the closest thing the league had seen to the Bulls dynasty. “So we’re, what, like only a third of the way there? I think it’s close. We still have a long way to go, but I do see the fandom, the fanfare like the Bulls had in the ’90s. I agree with everything Thompson is saying in this statement and the Warriors are the rare team that has a legitimate shot to match and even best that level of success, which has been unmatched in the NBA since the early days of the Boston Celtics when there were eight teams in the league. Two titles and three straight NBA Finals appearances is the beginning of a dynasty, but they need to sustain that success for the next three to five years to reach the levels of the 1980s Lakers or Celtics, 90s Bulls or even the Spurs of the 2000s.